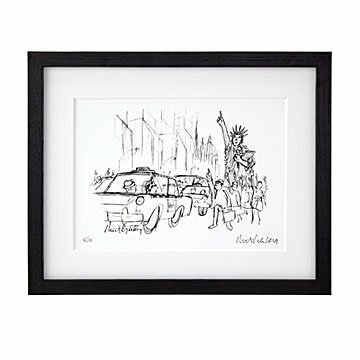 A limited edition print of New Yorker cartoonist Mort Gerberg's clever work, signed and numbered by him. "This was so essentially New York City, it seemed like such a natural pairing," recalls Mort Gerberg of his illustration for pulp magazine Swank in 1965. "Just one of those things where you look around, combine a couple images, and suddenly a cartoon is coming out of it." Known for his clever mix of wit and social commentary, Mort has been a working cartoonist for more than half a century, most notably for The New Yorker. "Liberty Hails" is one in a series of limited edition prints we're offering (just 10 of each), numbered and signed by him with the same pen he uses to draw. Framed in solid ash wood with a double-thick mat, it's a gift for the person who enjoys art with a wink. Printed and framed in Oregon.